Last month, we told you about the Lifesaver Bottle that aimed to help disaster survivors and trekkers get potable water by removing all microbiological waterborne impurities. 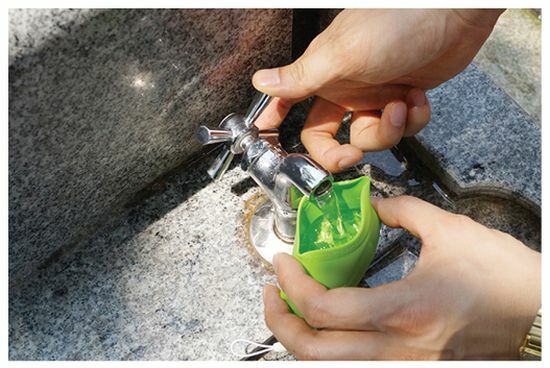 Thinking on similar lines, folks at Connect Design have come up with Pocket Cup to allow users to avoid plastic water bottles. The leaf-shaped, 100 percent silicone portable cup encourages consumers to reduce use of disposable cups. The Pocket Cup can be sterilized easily when needed. For doing so, what users need to do is turn the Pocket Cup inside our and boil it so that the contaminations die out eventually. Moreover, it could be used to hang and keep your toothbrush in place. Priced at $12, the Pocket Cup measures 8.5 X 12.5 (cm) and it’s available in three optional colors: light green, red and yellow.